Coca-Cola Netherlands is inviting the cult soda brand fans to compare the amount of calories they consume while drinking various beverages, ranging from water and iced tea to the company’s products. The improved version of ‘Calorie Compass’ (Caloriekompas) tool, which helps visitors to the www.coca-cola.nl website find out if traditional beverages like fruit juices are lighter than the iconic dark soda (its three most varieties) or not. The results really can impress. As it turns out, a 250ml serving of Coca-Cola Light contains one calorie and no sugar, while the same serving of apple juice has 108 calories and 25 grams of sugar. Visitors can also compare yoghurts, water, chocolate milk energy drinks, and iced tea—and the only product on this list that wins the ‘battle’ with the Coca-Cola Zero is (of course) water. The life-sized replica of the tool will be presented at the annual Home Lifestyle Convention in Amsterdam in February, and its display version will arrive in select stores soon (the company doesn’t mention if it will be in the Netherlands or in other countries as well). 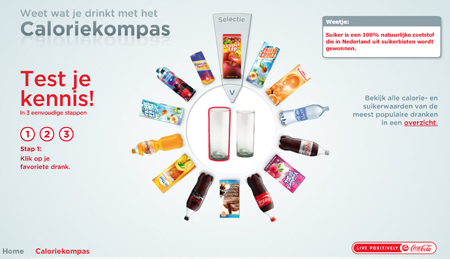 The Compass was first unveiled on the Dutch and Belgian Coca-Cola websites in 2009, but the current version is more interactive and provides users with more information on the drinks (by clicking on the ‘i’ button, they can browse through a drink portfolio page with informative fact sheets on balanced lifestyles, ingredients, product information, brands and responsible marketing).